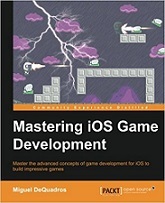 This book is for those who have created an iOS game already and want to hone their skills. A reasonable level of knowledge and an understanding of the core elements and applications would be helpful. Miguel DeQuadros is a game developer and the founder of the independent development studio, Wurd Industries, based in Ontario, Canada. He has been developing iPhone games since the release of the App Store back at the exciting release of iOS 2.0. Since then, he has released 10 games and 1 entertainment app world-wide on the App Store with more to come from Wurd Industries.